The Young Researchers' Lunch for January hosted David Edwards, professor in cereal genomics at the University of Western Australia. Dr. Edwards’ current research activities include the characterization of complex plant genomes, translational genomics, and genome informatics. He also worked briefly on rice genome structure in the Genetics Department of the University of Cambridge. 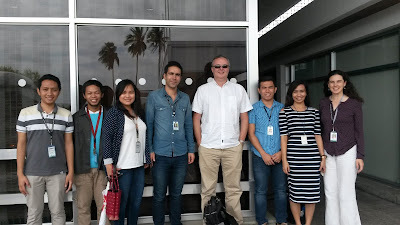 Dr. Edwards visited IRRI as part of the IRRI-Australia Symposium during Science Week. Dr. Edwards discussed his career path with the group. He emphasized the importance of being flexible in order to take advantage of opportunities that come up. Regarding research strategies, he encouraged the young researchers to stay focused, even if it means dropping a project that doesn't progress enough after a certain amount of time which, in bioinformatics, could mean 8-12 months. Dr. Edwards also stressed the importance of having a supportive family. Participants were Christine Jade Dilla-Ermita, Christian Cantos, Annalhea Jarana, Majid Mortazavi, Roven Fuentes, and Richard Garcia.